At the time, I was pretty clear in my response to the first question, less clear about the second one, but perfectly clear about the third. I had to write about something that would motivate me to explore it from different angles and maybe discover new things about it that I didn’t already know. And, having been involved with it for most of my adult life, I felt that squash would do quite nicely. Which it has. Nevertheless, the squash racket suggestion stuck in my mind, and stayed there until I’d qualified, both as a squash coach and as a personal development coach. By that time, I’d already come across dozens of articles and videos on ‘How to buy a squash racket’, all of which focussed on the technical aspects of the rackets themselves; racket head size, weight, grip, stringing and so on. All of them useful in their own way, but all of them fairly dispassionate. Which got me thinking. Coaches of every denomination will tell you that people are passionate about things and that different people are passionate about different things. They’ll also tell you that different people are motivated to do different things in different ways and in different situations, whether it’s at work, in business, in their personal lives or, more specifically, on a squash court. And, at different stages of their lives, different people, including squash players, are motivated to achieve different things. In fact, through psychology studies, we now know more than ever about what kind of things influence people not just to do things, but to make choices about what to do. Choices about finding a partner, choices about pursuing a career, choices about playing a sport and choices about what to buy. What Kind of Things Influence Us to Buy? So what influences us to buy? As you might guess, the factors affecting how customers make decisions are both numerous and complex in the way that they relate to each other. Buyer behaviour is deeply rooted in psychology with dashes of sociology thrown in for good measure. What’s more, since every person in the world is different, it‘s impossible to define simple rules that explain how buying decisions are made. But researchers who’ve spent many years studying buyer behaviour have come up with some useful guidelines to describe how someone decides whether or not to make a purchase. The guidelines describe two distinct categories of influence, internal and external, how they influence buying decisions – and how they influence marketing strategies. And those are what we’ll look at in this article. If we want to understand the first of these categories, we need to look inside ourselves to see which are the most important factors affecting how we make choices. In fact, there are seven to choose from which, together with the external factors we’ll learn about later, should give you a feel for what’s going on when you consider what to buy, or whether to buy something at all. Obviously, the number of possible combinations of factors affecting buying behaviour is astronomical. But, if we stick to a single type of purchase item (a squash racket), then at least we’ve got a fighting chance of understanding what might be driving our own buying behaviour as individuals. The first internal influence is perception, the way we filter information – such as the information obtained from a conversation with a fellow squash player, from watching a squash match or from reading an advertisement for a squash racket – and then make sense of it. How we perceive, as individuals, is determined by our personal approach to learning which, in turn, affects how we act. And we all learn in different ways. For example, some people are able to focus their attention on a specific advertisement and remember some or all of the information it contains after being exposed to it just once. Other people need to be exposed to the same advertisement many times before even recognising what it is advertising, let alone what brand of item it is advertising. Also, people are much more likely to retain information if they have a strong current interest in the stimuli associated with the information – such as the pleasure of owning and using a shiny, new squash racket. Marketers, of course, spend huge sums of money in their attempts to get buyers to form a positive impression of their products. But, clearly, the existence of people’s widely differing perceptual filters means that achieving this isn’t easy. Knowledge is sometimes defined as being (amongst other things) the sum of all of the information of which an individual is aware. In other words, the facts of their world as they know them. On the other hand, the depth of someone’s knowledge can be thought of as a function of the breadth of their worldly experience and the strength of their long-term memory. So, what exists as knowledge to an individual depends on how that person’s perceptual filters make sense of the information they’ve been exposed to. When it comes to selling a squash racket, marketers typically carry out research to find out what people know about their products. As we’ll see later, it’s likely that other factors influencing buyer behaviour are largely shaped by what’s known about a product or a brand. So perhaps it’s not surprising that marketers are always trying new ways of encouraging potential buyers to accept more information. Whether it’s factual or not. Attitude refers to what a person feels or believes about something and may be reflected in how they act, based on their beliefs. Once they’ve been formed, attitudes can be notoriously difficult to change and, if buyers have a negative attitude toward a particular squash racket or brand, marketers have to make huge efforts to change what those buyers believe to be true. So, marketers competing to attract customers typically try find out why people buying rival brands feel positive towards those brands. On the basis of their research findings, they then try to meet or beat their competitors on the most important issues; for example, the range of squash rackets on offer, pricing, appearance and so on. Alternatively, marketers may try to find rival customers who feel negatively towards their competitors and then try to increase their brand awareness. In his 2007 book The Personality Puzzle , psychologist David Funder described personality as “an individual’s characteristic patterns of thought, emotion, and behaviour, together with the psychological mechanisms (hidden or not) behind those patterns.” So, an individual’s personality should show itself through the characteristics they typically exhibit, particularly when they’re in the presence of others. Furthermore, in most cases, the behaviours people display in one situation are similar to thosethey display in other situations. Last, but not least, we all have our own vision of our own personalities, called a self-concept. Which, of course, may or may not be the same as others view us. 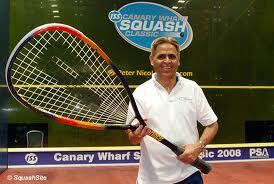 So how does all this influence our squash racket purchasing behaviour? Well, marketers know that buyers make purchase decisions to support their own self concepts, even if those self-concepts have little or nothing to do with the demographic category they fall into. For example, senior citizens may make purchases which help make them feel younger. So, appealing to the buyer’s self-concept rather than their age, occupation or income, can help marketers to increase the size of their target audiences. What’s your lifestyle? How do you live your life through the interests you have, the things you do, and the things you spend your money on? Put simply, our lifestyles reflect what we value in our lives. People buy products and services to support their lifestyles. And marketers have always tried to find how potential buyers in their target markets live their lives as this helps them to work out what kind of products to develop. It also helps them to work out what promotional strategies are most likely to be successful in selling those products, and even how best to distribute products based on where most of their buyers live. So how does squash support your lifestyle? Is it in a social context, a cultural context, a health and wellbeing context, a commercial context (think squash coach) and so on. It may support your lifestyle in a number of ways, some of which you may not even have thought about. Whatever your own personal involvement with squash, your values, and how you honour them, directly influence your lifestyle. And which squash racket you’re likely to buy. From a marketing perspective, motivation is linked to the concept of involvement. And involvement is all about the amount of effort a buyer is prepared to exert in making a decision. Highly motivated buyers typically want to get mentally and physically involved in the buying process. Obviously, not all products (milk, for example) attract highly motivated buyers. But marketers promoting products that invite a high level of buyer involvement (such as a squash racket) will typically use strategies that are attractive to this kind of buyer. So, they will tend to make it easy for buyers to learn about their product; for example, by providing information on a website or providing access to video footage of the product being used or just described. For some products, they may allow customers to use the product in a free trial before expecting them to commit to buying it. Handling a squash racket or even taking it on court to try it out are examples of this kind of marketing involvement strategy. Who Do You Think You Are….or Would Like to Believe You Are…. In the natural course of living our lives, we all perform multiple roles. Roles in the context of our personal lives, our professional lives, and our working lives. Roles represent the positions we feel we hold or that others feel we should hold when interacting with other people in a group context. These positions carry certain responsibilities, some of which may, in fact, be perceived and neither agreed or even accepted by others. Buyers tend to make product choices that vary depending on which contextual role they are assuming. In other words, their buying decisions support their role identities. So, the captain of a squash team selecting a racket for use in competitive matches may choose a more expensive or ‘higher perceived status’ racket than they would choose for use by a member of their family. So, marketers often show how their products will benefit buyers as they perform certain roles. Typically the underlying message of this promotional approach is to imply that using the product will help raise the buyer’s status in the eyes of others whereas using a competitor’s product may have a negative effect on status. So, now we know about the internal influences on our buying behaviour, what else is likely to affect the way we decide which squash racket to purchase? In Part 2 of ‘The Psychology of Buying a Squash Racket’, we’ll look at the external influences affecting our buying behaviour. We’ll also find out about how consumers buy – and how they feel afterwards. For a fascinating description of ‘Consumer Buying Behaviour’, go to the excellent KnowThis.com marketing website. You’ll never look at the process of buying a squash racket in the same way again!